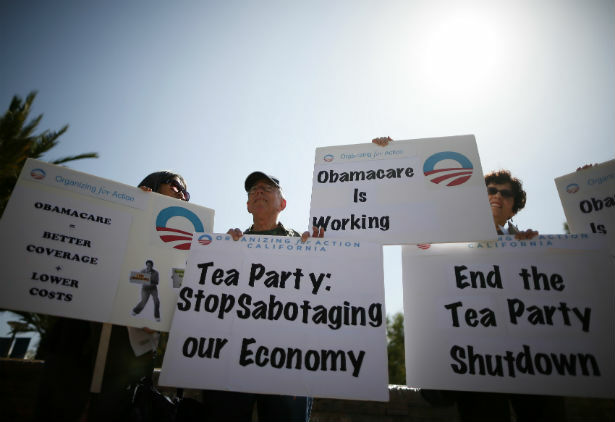 Conservative judges ruled to effectively gut the health law in twenty-seven states. A divided three-judge panel in the nation’s capital ruled Tuesday morning that the federal government cannot provide Affordable Care Act subsidies through exchanges run by the federal government—a decision that, if it stands, would functionally end Obamacare as it exists today. Halbig v. Sebelius is based on an idea first advanced by a conservative scholar deeply opposed to the healthcare law. It involves a drafting error in the Affordable Care Act—a “glorified typo,” in the words of the Center for American Progress’s Ian Millhiser. The law creates exchanges for buying individual health insurance plans in each state, and says states can either create their own or have the federal government step in and do it for them. Twenty-seven states, usually controlled by conservative governors or legislatures, declined to create exchanges and have federal ones. But in the section governing subsidies, a literal reading of the law appears to limit federal subsidies to people who are buying in “an Exchange established by the State.” The conservative activists behind this lawsuit—and the two judges who agreed with them Tuesday—say this means that people who aren’t in exchanges “established by the state,” that is the people in twenty-seven states with federal subsidies, are ineligible for subsidies. The language is indeed a little unclear, and that line should have made it explicit that subsidies would be available in all exchanges, state or federal. But the Supreme Court has long held that ambiguous language in isolation does not vitiate the otherwise discernible intent of a law—and here it’s extremely easy to figure out what the Democrats who passed the ACA intended, not least because they filed a brief with the court explaining that, of course, the subsidies were supposed to go to any person in an exchange. To believe otherwise, as the two judges in this case claim to do, would be to assume that Democrats intended to pass a law that would fail within a few years of enactment. That’s just what would happen if this decision holds. A recent Urban Institute study found that 7.3 million people—close to two-thirds of all Americans enrolled in exchanges—would lose $36.1 billion in subsidies. People would start dropping out of the exchanges and declining to buy insurance because they couldn’t afford it; in turn, health insurance companies would have to jack up premiums for existing customers to make up for the lost revenue. The individual insurance market would essentially collapse in twenty-seven states. As a political matter, that could be a bit tricky for the conservative politicians celebrating the decision, like South Carolina Senator Lindsey Graham. The 183,000 South Carolinians projected to receive subsidies on the federal exchange there would lose their subsidies, which cover about 80 percent of the premium costs should Tuesday’s decision in Halbig be affirmed by the Supreme Court. Most of those people are probably middle or lower-middle class, since they are eligible for subsidies. That’s a tough thing to champion, even for conservative politicians. They should also be wary of an ultimate victory for the plaintiffs in Halbig because, conservative governors would feel immense pressure to enact a state exchange to avoid the massive loss of subsidies and skyrocketing premiums. But we’re a long way from that. The Obama administration—which has already said subsidies will continue to flow as Halbig is litigated—quickly asked for an “en banc” ruling from the entire DC Circuit Court of Appeals, which has a majority of Democratic nominees. It would likely not rule in favor of the plaintiffs, and were the Supreme Court to consider that decision, most legal experts just don’t see enough existing case law for the conservative majority to affirm the plaintiff’s view. If it does, however, Obamacare will spin badly off its axis.